“Inspirations and Influences” is a series of articles in which we invite authors to write guest posts talking about their Inspirations and Influences. In this feature, we invite writers to talk about their new books, older titles, and their writing overall. On November 24 (tomorrow!) we will publish The Price You Pay is red by Carlie St. George–the d in The Spindle City Mysteries, a series of interconnected novelettes that will be published between now and December 15. Today, Carlie St. George is here to talk about the inspiration behind the first story. Give a warm welcome to Carlie St. George, everyone! About a year, year-and-a-half ago, I watched Laura for the first time. If you’re unfamiliar, Laura is a 1944 film noir starring Dana Andrews, Gene Tierney, and Clifton Webb, and it’s about a homicide detective who falls in love with the woman whose murder he’s trying to solve. Honestly, I have mixed feelings on the movie itself (wonderfully snappy dialogue, ridiculously rushed romance), but I find its premise pretty fascinating, and I figured, “Kid, you could probably do something with that.” The Price You Pay Is Red was intended to be my big homage to Laura. Predictably, this fell apart almost the moment I started writing it. The problem was this: I was trying to write two different love stories simultaneously, and unless I was going to expand my novelette into an actual novel, I just didn’t have the space for both. Prince was supposed to discover Snow White’s body and, over the course of his investigation, slowly start falling for her. Not necessarily head over heels in love— Prince was never going to stand in the middle of some rainstorm, cursing the merciless heavens with a shaking fist and weep for his beloved or anything like that. Most likely, he’d never drop the big “L” word at all. But the more Prince learned about Snow, the more he’d feel drawn to her, or at least drawn to his idea of her, anyway. He’d idealize Snow and, gradually, become obsessed with solving her murder. The Price You Pay Is Red was supposed to be, at least in part, a story about how we literally romanticize the dead. But suddenly I couldn’t do that because Prince was already falling in love with someone else, and as that romance took priority, the story… shifted. Instead, I started playing with the idea of how we perceive the living, because it’s not only the voiceless dead who we idealize, objectify, or condemn. This isn’t always a malicious act — perception, by definition, is how you understand and judge the world around you — but too often we force our own values and judgments on others without the slightest regard as to how they perceive themselves. And it does become malicious when we refuse to acknowledge other people’s aspirations, relationships, or identities, when we hear them say, “This is who I am,” and simply choose not to listen. This is especially true in Spindle City, where no one is who they claim to be— but how many of those supposed two-faced people actually wanted to lead double lives in the first place? Evelyn Prince, for instance, is one of the most powerful women in the city, but her power largely comes from being continuously underestimated. And no one sets out to be underestimated; no one dreams that the world will find them so incompetent as to be utterly incapable of their greatest achievements. Like many in Spindle City, Evelyn lives her double life not because she wants to, but because she’s working with the best of limited options. And Snow White is no different. My original plan may have been to write about Prince falling in love with some kind of ideal, but plans change. Instead, I sort of ended up writing about everyone’s relationship with Snow, about how they loved her or despised her, despite never really knowing her at all, and how the world at large had forced a face on her just like they’d forced a face on Evelyn Prince. Snow learns to wear that face, to manipulate all those people with all their expectations, but is that how she hoped to live her life, or simply how she fought to have power, to try and survive? The Price You Pay Is Red is a mystery about what happened to Snow, but it’s also a mystery about who she really was and why she really did the things she did. That’s the kind of mystery that doesn’t exactly come with any easy answers, but hey, that’s Spindle City for you. If you’re looking for easy, you’re in the wrong town. In addition to offering the Spindle City Mysteries through our regular channels, we are also serving up these stories via subscription: Spindle City Serials is a brand new way to get your fix of Jimmy and Jack every week as they take on the nefarious characters who work Spindle’s dark underbelly. With a subscription ($4.99 total), you receive serialized episode-sized chunks of the books 2 and 3 in the Spindle City series delivered to your inbox every Monday morning. AND, at the end of each story arc (2 arcs of 3 episodes each), you’ll receive a DRM-free ebook of the full story as part of your subscription (including a copy of Bloody Slipper, on us). 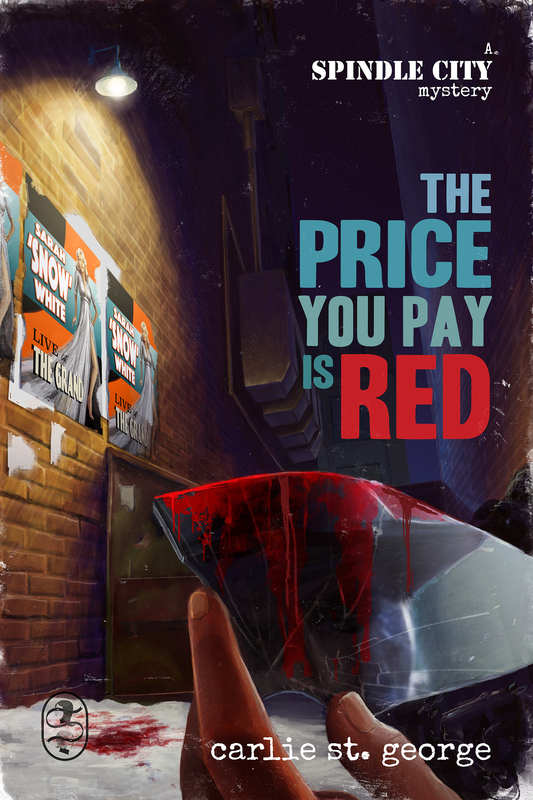 Episode 3 of The Price You Pay is Red goes out tomorrow – you can sign up at any time (and you’ll receive links to previous episodes you may have missed!). There is still time! Add the book on Goodreads, and read The Price You Pay Is Red for free online on November 24, 2015.